Is The Book Of Nehemiah Playing Out In 2017? Is it possible that the Book of Nehemiah is playing out prophetically in 2017? I was reading through this book the other day and I discovered some striking parallels. For starters, it is in Nehemiah 2:1-9 that we discover the decree spoken of in Daniel 9:25 where Artaxerxes I allows Nehemiah to lead an effort in Judah to rebuild and restore Jerusalem. The king sends with Nehemiah letters or "decrees" granting him permission to undertake the rebuilding. Nehemiah 2 is the terminus a quo for the counting of Daniel's 70 "weeks" of years. There were 69 "weeks" of years from this decree until Christ's Triumphal Entry into Jerusalem and the 70th week has not yet begun - it is the Tribulation. Considering that we are awaiting the beginning of Daniel's long-postponed 70th week, it is not surprising that God would point our attention back to the very book where the counting began. The subject of the book is the rebuilding of the walls of Jerusalem. Nehemiah hears that Jerusalem is in ruins (Nehemiah 1:1-4) and he wants to make Jerusalem great again (Nehemiah 2:17). On January 20, 2017, Donald Trump became President of the United States while declaring his intention to "make America great again" and build a wall across the United States' southern border. On the fence - it's not a fence. It's a wall... We're going to build a wall. I could wait about a year and a half until we finish our negotiations with Mexico, which we'll start immediately after we get to office, but I don't want to wait. 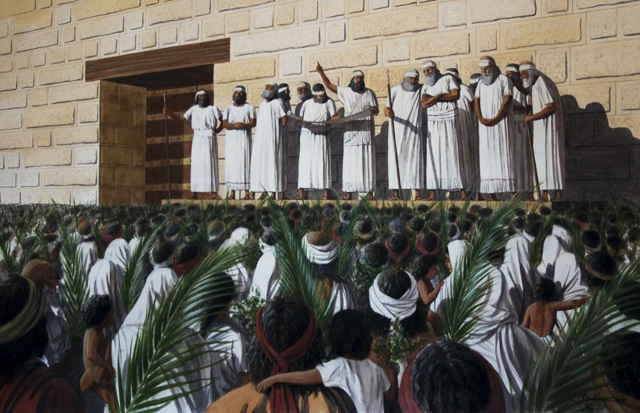 In Nehemiah 2:19, the non-Israelite opposition shows up, mocking and ridiculing Nehemiah's plan to build the wall. This raucous opposition gives Nehemiah trouble throughout the rest of the book. Interestingly, the newly inaugurated President Trump is facing what pundits recognize to be the fiercest political opposition since the Vietnam War. They are mocking and ridiculing him just as Nehemiah's detractors did over 2,400 years ago. It now gets even more interesting. At the time of Nehemiah, the Israelite exiles in Babylon had returned to Israel and had been living there for less than a century. The exile formally ended in 538 BC when King Cyrus gave the Jews permission to return. The decree from Artaxerxes I was given in 444 BC, so from the end of the exile to the decree was 94 years. It is this last quote, which is Article 6 of the Mandate, that is most important. It decreed that the British administration of the Holy Land would permit and facilitate the return of the Jews to their land - the formal end of the Jewish exile during the Church Age. Returning to Nehemiah's time we see that his Palestinian opposition did not like that he regarded the welfare of the Israelites (Nehemiah 2:10) and they set out to ruin his plans. Likewise, it appears that Trump is the first President since at least Reagan who favors the Israelites - going so far as to suggest moving the U.S. embassy to Jerusalem and refusing to endorse the two-state solution. The next thing I want to draw your attention to is the Revelation 12 Sign on September 23, 2017 and its possible connection to the rapture and beginning of Daniel's 70th week. The sign occurs on, or one day after, the Feast of Trumpets, in the very year Trump-Pence are inaugurated as President and Vice President of the chief Gentile nation and only earthly defender of Israel. From when the decree came into effect ending the Church Age exile of the Jews on 29 September, 1923 to September 2017 is 94 years. The same number of years that transpired between the end of the exile in 538 BC and the decree to restore and rebuild in 444 BC. Notice not only the exact parallel in number of years, but also that the decree came into effect in 1923 and the Revelation 12 Sign occurs on 9/23 of 2017. And all the people gathered as one man into the square before the Water Gate. And they told Ezra the scribe to bring the Book of the Law of Moses that the Lord had commanded Israel. So Ezra the priest brought the Law before the assembly, both men and women and all who could understand what they heard, on the first day of the seventh month. And he read from it facing the square before the Water Gate from early morning until midday, in the presence of the men and the women and those who could understand. And the ears of all the people were attentive to the Book of the Law. And Ezra the scribe stood on a wooden platform that they had made for the purpose. And beside him stood Mattithiah, Shema, Anaiah, Uriah, Hilkiah, and Maaseiah on his right hand, and Pedaiah, Mishael, Malchijah, Hashum, Hashbaddanah, Zechariah, and Meshullam on his left hand. And Ezra opened the book in the sight of all the people, for he was above all the people, and as he opened it all the people stood. And Ezra blessed the Lord, the great God, and all the people answered, “Amen, Amen,” lifting up their hands. And they bowed their heads and worshiped the Lord with their faces to the ground. Verse 1 says that the people gathered together, literally in the Hebrew "as one man". And incredibly the day on which this gathering in Jerusalem occurred was the Feast of Trumpets - the first day of the seventh month. Revelation 12:5 describes the corporate Church as the male child or man-child - the whole body of believers represented as one man (see also Ephesians 2:15). This child is caught up to the heavenly Jerusalem (Hebrews 12:22). And again, the Revelation 12 Sign in 2017 appears on the Feast of Trumpets. It was on the Feast of Trumpets in 444 BC that the restoration of Jerusalem was completed and the people were gathered and committed themselves back to God. Likewise it may be on or near the Feast of Trumpets in 2017 that God determines that the restoration of Jerusalem that began in 1967 is completed and the Church is gathered to God. Then the next chapter in prophetic history can begin, which is an earthly refocusing on the Jews and the rebuilding of the Jewish Temple. There seem to be a ton of things pointing to this fall. I am amazed by how many different things and parallels are lining in up in different ways. I think there is more to this Nehemiah thing too. We may be off in our interpretation. There's still a lot of mystery in God's word. But I believe that, as mentioned in Daniel, God's people are finally starting to understand His word. If it's an honor for Kings, how much moreso for common folk like me? I don't know if it will be this fall or not. It's not like we'll have a 2 weeks notice, and be able to contemplate what we got right and wrong in our eschatology. Perhaps we'll have that blessing on the other side, or perhaps we won't care. But even if the Rev. 12 sign and other events this fall are not the rapture, I look at it as a giant billboard message in the sky from our Creator. Warning to the unsaved, blessing to those looking for His return. Same with this article: it might not portend our ultimate redemption in the rapture, but might have been given to Gary to spur those who read to do one more thing for the Lord's glory before time runs out. Man, it just keeps getting better. I was especially surprised by Neh. 8:1 and how it reads literally in Hebrew, "as one man" gathered together. Awesome. Notice this passage mentions 70 years, which is the amount of time from 1947 to this year, 2017, and it mentions the rebuilding of the Temple. I also note that it appears to be spoken prophetically at a time of world peace. Would it not be fascinating if events this year moved toward the time when the world is proclaiming "peace and safety" and the time when Israel will be a land of unwalled villages? "Of that day and that hour knows no man" is the nick name for the Feast of Trumpets. Few people know this. Few have asked God to reveal His truth. While most Christians use these words to believe that we don't know the day of Christ's rapture, it is actually GIANT CLUE as to the definite time. He will fulfill the Feast of Trumpets obviously, it's the next one to be fulfilled and it's the Feast of TRUMPETS which is how this event is described as JESUS coming with the sound of trumpets! Shofars. So we DO know the Feast. Due to the way this Feast begins it is described in this way: "of that day and that hit knows no man". When the first sliver of moon is seen in the sky a priest blows his shofar (trumpet) and it is heard at the next watchtower. The priest there then blows his shofar and so forth until the entire nation knows to start the Feast. No one knows EXACTLY when to begin the Feast because they await the sound of the shofar. The nick name is priceless. Because it is the clue that is usually missed. It's like me saying "come to my house on Thanksgiving day". I don't need to give you the date because you know the day will be Thanksgiving. And so it is with the Feast of Trumpets: Of That Day And That Hour Knows No Man. Praise the Lord for His marvelous ways and the precision of His dates and times.